UPDATE 10/23/2018 — The Cornucopia Institute has updated its scorecard analyzing the votes of NOSB members. A comprehensive voting analysis of members of the National Organic Standards Board, an expert body formed by Congress to insulate the governance of the industry from undue corporate influence, clearly illustrates how illegal appointments to the board by current and past USDA Secretaries have subverted congressional intent. The study, produced by The Cornucopia Institute, a Wisconsin-based farm policy research group, analyzed the voting record of each individual board member beginning in 2010, including corporate representatives who were placed on the National Organic Standards Board (NOSB) filling seats that were specifically set aside for farmers and other independent organic industry stakeholders. Cornucopia’s analysis comes two years after the policy group released a white paper entitled The Organic Watergate. That report documented how a number of risky and/or gimmicky synthetic or non-organic materials were approved for use in organics. It highlighted a couple of board members, appointed as “farmers,” who did not meet the intent and legal qualifications that Congress had set out for composition of the board. “We have two members of the current board, both sitting in seats that Congress had designated for someone who must ‘own or operate an organic farming operation’ but who were actually agribusiness employees when appointed to the five-year term on the NOSB,” said Kastel. Of the four seats reserved for farmers on the current board, one is held by an employee of the giant California berry marketing firm, Driscoll’s (which does not grow organic strawberries but rather relies on contract farmers) and one by an individual who, when appointed, worked for the country’s largest organic marketing cooperative, CROPP ($928 million in annual revenue). The voting records of these two agribusiness employees are significantly lower than those of the actual farmer members of the NOSB. Voting records for the current 15-member NOSB board members include three independent members with a history of voting over 90% of the time to block practices eroding organic integrity. These board members are Jennifer Taylor, public interest/consumer representative and academic; Jay Feldman, environmentalist and executive director of Beyond Pesticides; and Colehour Bondera, a certified organic farmer from Hawaii. On the other end of the ideological spectrum, the agribusiness voting bloc all had voting records under 50%, with one member voting with mainstream positions on maintaining organic integrity only 10% of the time. Voting scores of NOSB agribusiness representatives include those of Harold Austin (10% — handler with Zirkle Fruit), John Foster (16% — handler with WhiteWave/Earthbound Farms), Carmella Beck (17% — “farmer” with Driscoll’s) and Wendy Fulwider (34% — “farmer” with Organic Valley/Whole Foods-GAP). The study’s analysis was based on Cornucopia’s policy positions over the past five years, prepared by experienced organic farmers, policy experts, former certification officials, and staff scientists with doctorates in related agricultural disciplines. “The policy positions Cornucopia has publicly taken (and used for the scoring criteria) are clearly in the mainstream of thought within the organic community and are consistent with those taken by the vast majority of other consumer, environmental and farmer-supported organizations,” Kastel affirmed. Kastel noted that a separate analysis by Cornucopia compared the industry watchdog’s official written and oral public testimony on issues before the NOSB with that of other nonprofit groups. That analysis showed that Cornucopia’s policy positions were 100% compatible with that of 10 of the 12 nonprofit groups actively involved in lobbying at the NOSB over the past two years, including the Center for Food Safety, Food and Water Watch, Organic Consumers Association, Beyond Pesticides, and Consumers Union. Cornucopia scored an 86% compatibility with the policy positions of the National Organic Coalition, an umbrella group made up of farm organizations, retailers, and organic businesses. Marchese had applied for the NOSB three times in past years. One of those years saw USDA Secretary Vilsack choosing Driscoll’s Carmela Beck for the farmer seat. In addition to the well-defined “independent” and “corporate” voting blocs, Cornucopia found that about a quarter of the board qualified as true swing voters. “After the publication of The Organic Watergate, a number of board members and other organic industry stakeholders, including myself, were surprised by the degree that the NOSB system of vetting synthetics and non-organic materials allowed for temporary use in organics was just plain not working,” said Cornucopia’s Kastel. 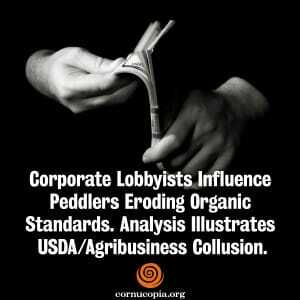 In addition to corporate members being illegally appointed to the board, Cornucopia’s Organic Watergate report also uncovered that agribusiness executives and consultants had been hired by the USDA to do “independent” technical reviews of materials brought before the board. The apparent conflict of interest and bias of these contractors is highly disturbing since the NOSB is not a scientific panel and Congress provided for access to independent scientists to advise the body. “I think the more recent record of some swing voters indicates that the NOSB is now taking a much more critical view of what is presented to the board by the corporate lobbyists that claim the materials are essential to organic production,” Kastel added. The law governing organic production, the Organic Foods Production Act of 1990, calls for the NOSB to vet all non-organic materials to assure they are not a danger to human health or the environment and are actually necessary for the production of organic food. Cornucopia’s analysis shows that some swing voters have seen their voting scores materially change over the past two years. As an example, the voting record of newly elected board chairperson Jean Richardson, a respected academic and former organic inspector, has moved up to 67%. Cornucopia has stated that one of their goals in performing this research is to illustrate to the Secretary of Agriculture that his appointments will be closely scrutinized in terms of legality and as to whether he has sold out the organic movement through undermining the will of Congress and the majority of industry participants in favor of corporate profit and expansion. Many organic farming pioneers would never have supported the USDA overseeing the industry they founded if Congress hadn’t agreed to create a strong NOSB as a defense against business as usual in Washington, an all-too-common cozy working relationship between agribusiness lobbyists and the USDA. A broad section of the organic community has vigorously protested these moves, which were made, in conflict with the law, with no input from either the NOSB or the organic community at large. Protesters have included the two key congressional authors of the Organic Foods Production Act of 1990, Senator Patrick Leahy of Vermont and Representative Peter DeFazio of Oregon. 1. Representatives of Whole Foods and Organic Valley voting for, at sunset, continued use of the coagulant and thickening agent carrageenan, when their respective companies utilize the ingredient in their products. Carrageenan has been controversial for years, with all industry-funded studies declaring it perfectly safe while independent medical researchers (mostly funded by the National Institutes of Health) find it to be a potent intestinal inflammatory agent causing serious disease and even cancer. Many industry observers contend that representatives of companies like Whole Foods and Organic Valley, due to conflict of interest, should not be permitted to participate on NOSB votes that economically benefit their employers. 2. When the NOSB debated tighter standards, in an effort to force industrial-scale livestock producers to provide outdoor access for laying hens and other poultry, the Organic Valley employee on the NOSB voted in favor of providing a minimum of 2 ft.², outdoors, for each laying hen. Organic Valley sets standards for their own farmers requiring a minimum of 5 ft.². In the European Union chickens are required to have a minimum of 43 ft.² of pasture and no more than 3,000 birds per building. Currently in the U.S., factory farms producing the majority of all “organic” eggs are providing no legitimate outdoor access, in buildings that hold as many as 100,000 birds. Agricultural policy experts at Cornucopia have stated that a 2 ft.² requirement would be woefully inadequate in terms of meeting the intent of the organic standards, promoting the humane treatment of animals, environmental protection and producing eggs with superior taste and nutritional profiles. The Cornucopia Institute has also warned USDA Secretary Tom Vilsack that it would be viewed as “hostile and cynical” if he made a new appointment to the NOSB of someone who technically qualified as a farmer but has acted as a spokesperson for a major corporate player in the organic arena. As an example, Dean Foods/WhiteWave has paid thousands to fly farmers around the country representing the company, including in front of the NOSB. “Although these farmers might legally be qualified as ‘owning or operating an organic farm,’ they would surely be viewed as carrying the water for their corporate benefactors, once again undermining the collaborative framework that Congress had intended,” said Kastel.